Summer to some means sitting outside in the sun and going off on holidays, but for me – at least over the last few years – it’s meant the chance to work on some interesting projects and earn some money for the year of uni ahead. It might not quite sound as fun, and my tan definitely doesn’t benefit much from it, but it’s always great spending the summer building something that will leave a legacy. This summer I was working for the Ross & Cromarty Citizens Advice Bureau. Back in March I saw that they were looking for someone to develop a new website for them, and given their location in my hometown of Dingwall, the type of project it was and the work that they do, I thought it was a great way of doing something different over the summer that still plays to my strengths. 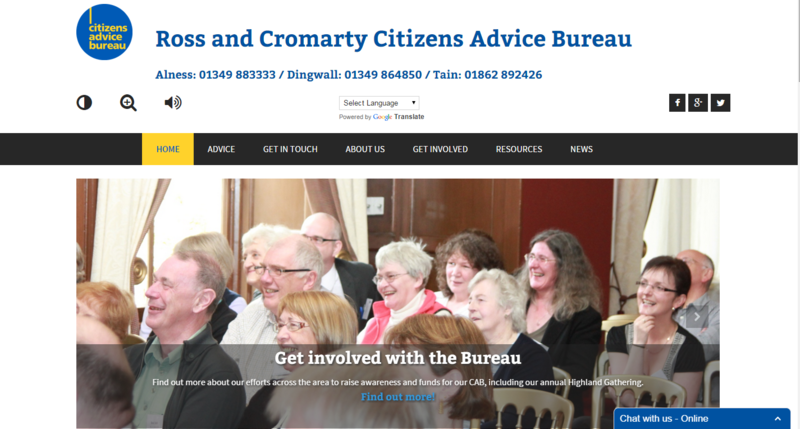 The Ross and Cromarty CAB is one of many CABx (Citizens Advice Bureaux) across the country that provide free and impartial advice to people that are looking for help. The bureau can advise on almost anything at all, but generally the issues they are called upon to help with most are to do with benefits, debt or housing issues. It’s a fantastic service run by a dedicated and knowledgeable set of volunteers and paid specialists and one that I think more people should be aware about. Initially the idea was that I would come in and revamp the website they already had, but a cursory glance at the old website by even the most technophobic person would say that it was a task beyond saving. The old site was built using Weebly, a platform that allows for drag and drop editing, which is okay for basic sites and absolute beginners but extremely outdated and functionless for any website looking to do a little bit more. The old design was garish, to put it mildly, and the website had little to no content to speak of. Using it on mobile was a trying ordeal. If you’re brave enough, you can see the bones of the old website here. Revamping this was impossible; it was time to rebuild from scratch. Armed with a few basic ideas of what the site needed to do and a few ideas of what I thought the site could do, I went on researching other CAB websites across the country hoping to find inspiration as to what our new website could be. It was then that I found that most of the other CABx were in a similar predicament to the one here, with websites that simply aren’t fit for purpose. So I set about building what I think is the best CAB website in Scotland. I wanted to create a simple and clean design that made the content of the site front and centre but didn’t overload users to much. The contact details of the bureau are found at the top, side and bottom of each page to make it easy as possible for people to find. The site was built with responsiveness in mind, so that it looks good on desktops, mobiles and tablets too. There are now four times as many pages on the site, including detailed information about the different areas in which the CAB helps people and the specific project they run to help those most in need. Anyone who wants to know how we can help can now find out online. I created my own accessibility functions to allow contrast changing and font-size changes, to help people with visual impairments use the site more easily. Using plugins and other techniques didn’t seem to work reliably, so the website has been built with these options baked in. I also included a Google Translate plugin, which will help visitors who speak other languages (particularly Polish) find out about the service provided, and a text-to-speech plugin which allows users to highlight text and have it read back to them. These might not be used by the general public at large, but for the people that do need these functions it will really make a difference and let them engage with us in a way they couldn’t before. I included a live opening hours segment so that people could see at a glance whether or not the bureaux were open for people to drop-in or call (including functionality for holidays or extra sessions), which is a small technical achievement but one that makes the website much more usable. This makes our connection with our clients that little bit stronger. The old site didn’t even have a contact form, but now the site features an enquiry form, appointment booking and live chat support (via the great and free Tawk.to service). I was also able to create online versions of the CAB’s own Benefit Check and Money Advice forms which are used to help clients – which will hopefully streamline the process for anyone wishing to use those services. The level of support we offer almost always requires clients to come in to the bureau to discuss their issues but having a first point of contact online can make it easier for clients and the advisers by creating an understanding of what an appointment will be able to achieve. The site also features e-commerce support, which will allow the CAB to take orders for its’ Highland Gathering event online in a much more simplistic way than they could have before and even take donations from any kind member of the public that feels they want to help. I’ve thoroughly enjoyed working for the CAB over the summer. Working for an organisation that makes a difference to so many people’s lives is extremely rewarding and the idea that the site I’ve build will help people towards that is a great feeling. The work of the CAB was unbeknownst to me before I started working for them, but as I sat there in their offices all summer I learned of some of the real difficulties that people in my own community are facing. Hearing about benefit changes and foodbanks sounds bad when it’s on the news – but it doesn’t hit home at all until you realise that these are things that impact on many people’s lives that live in the same place you do. Seeing this first hand was an eye-opening experience, and something that will stay with me long after leaving for the summer. It’s soon time to get back to uni for the final year of my degree, but once again although my summer’s not been full of fun or sun I’ve been able to build something I’m proud of – which is just as good.